Chemical Abstracts; Engineering Info., USA; Opto-Laser Info, USA, Scopus. Nonlinear Optics, Quantum Optics: Concepts in Modern Optics publishes primary papers reporting original research, review articles and rapid communications. 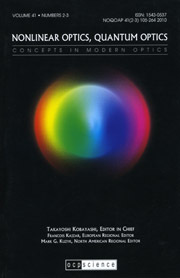 Principles: covering studies into the fundamental theoretical understanding of the origins and mechanisms of nonlinear optical processes; theoretical studies of application of controlled optical field to quantum information processing including quantum communication and computation and fundamental problems of quantum mechanics related to quantum information processing. Experimental: devoted to papers on the discovery of new nonlinear optical phenomena, measurement of nonlinear optical processes; observation of ultrafast and fast nonlinear optical processes, and the characterization of nonlinear optical materials by new measurement methods; demonstration and proposal of non-classical information processing using manipulated optical field. Materials: including work on the solid state physics of semiconductors and dielectrics, and organic and polymer compounds exhibiting nonlinear and electro-optical behavior. Devices: featuring fundamental research articles on applications to devices, optical switches, optical bistable devices, phase conjugation, and optical logics; prototypical device operation demonstrating the quantum features of optical fields. The journal recognizes the multidisciplinary nature of this field, and will include materials science and device implementation material, the physiological aspects as well as information science. The editors place emphasis on the importance of mutual interaction among the fields. Contributions should contain original results not published elsewhere. Papers submitted for publication must be in English and must follow a prescribed format. All papers will be subjected to a critical peer-review prior to publication. The editors of Nonlinear Optics, Quantum Optics: Concepts in Modern Optics invite your contributions. Click here for a list of papers that have been peer-reviewed and accepted for publication in NLOQO but have not yet been assigned to an issue and are awaiting final changes. A forthcoming paper is not published until it has been assigned to an issue and the final proof has been approved by its author or authors.